We’ve all been affected by lax security settings. First it was Target: 100 million customers. This week’s headlines are the Russian thieves stealing 1.2 billion customer security credentials. Don’t let your company become headline news. 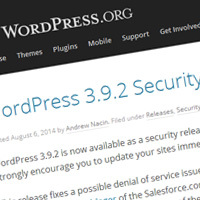 WordPress released an update to patch four security concerns. We encourage you to update your WordPress based Web site as soon as possible. If you are uncomfortable updating WordPress by yourself, 4word Systems is here to help. We work with WordPress every day and will make the upgrade easy for you. Before you think, “No problem the passwords on our site won’t affect anything if stolen,” please consider this: Many people who create accounts on the Internet use the same password everywhere. If a viewer made an account on your site and your site is hacked, that password could open the door to their bank account or Facebook page. Although we can’t stop all Web site hacks, when a security release is announced, it’s a wise decision to apply it as soon as possible.